The Lodge Café is very privileged to be the first ever café in the beautiful grounds of Grosvenor Park. Through our café, the importance of preserving the parks great heritage is reflected in everything from our décor to our staff uniforms. 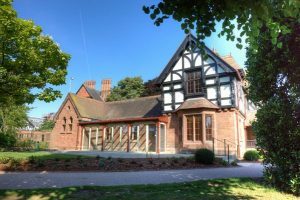 Located close to the Grosvenor Park Road entrance, the family friendly café is on the ground floor of Park Lodge. It’s a Grade II listed building, which was once home to the park keeper. The Lodge Café is the first known example of the black-and-white style of Cheshire architect John Douglas, who designed many buildings in the city centre. The external walls bear carvings representing William the Conqueror and the seven Norman Earls of Chester. The elegant design of The Lodge Café, with its comfortable furnishings and heritage style menus was inspired by the cultural heritage of the 20 acre park. Opened in 1867, it is one of the finest and most complete examples of Victorian parks in England. The Lodge Café is part of Retain Wellbeing CIC, a not for profit basis, by providing opportunities for disadvantaged individuals to transform their futures through social initiatives and through our social initiatives provide inclusive spaces for people who maybe socially isolated. We currently operate a number of social enterprise cafes across Chester, Liverpool and Wirral. Through our establishments, we offer trainee programmes to individuals which are designed to provide them with work related skills and a chance of obtaining permanent employment. By eating or drinking in our cafes, you’ll be supporting your local café, local jobs and our local GIFT Network tacking social isolation. Here at The Lodge Café, we pride ourselves on being a community café and encourage everyone to relax in beautiful surroundings.